Another PS2 to PSP conversion? Jeez!! But before you look away, it's not a conversion, but a whole new outing for the ever popular duo that is Ratchet and Clank, a sharp-shooting furry guy and a tiny robot positively bulging with insane technologies. Having starred in four PS2 games and two mobile phone games so far, it was inevitable that, like Jak and Daxter, the duo would grace Sony's slick PSP. For this new outing though, the development duties have been handed over to High Impact Games, a company comprising of former Insomniac (the original Ratchet and Clank developer) employees who will have no doubt had the experience of working on the earlier games featuring the mascots. Long time fans of the series will most likely be aware of the upset caused by the PS2's last Ratchet and Clank game, Ratchet: Deadlocked. Where our small robot friend found himself sidelined in what became pretty much a full-on shooting game, lacking the platform and puzzle fun that we'd grown to know and love. So it's nice to see that this time around they've gone back to the original formula, but have also expanded on the game by giving Clank some opportunities to wreak havoc on his lonesome. The plot goes that our the pair have decided to take a well-deserved vacation, away from all the trouble that usually lurks just around the corner. They meet a girl named Luna who asks if they can help her out on a school project about heroes like themselves, only for her to get *gasp* kidnapped by a horde of evildoing robots! Well, we never saw that coming. So, being the heroes that they are, they set off on a mysterious quest (as quests usually are) to thwart the evildoers and rescue the girl. They soon discover a race of ancient inventors, the Technomites, whose plan is, as ever, to take over the entire universe! Bwaaaahahahahahaah! Ahem. Now, you know that the Ratchet and Clank games are famous for their use of a huge array of unconventional weapons, crazy villains and labyrinthine levels. This is no different just because it's a PSP outing, we're still going to be blessed with some outrageously wacky guns that'll no doubt do all manner of unspeakable things to your enemies. Then there's Ratchets armor, where you can swap around different types of gloves, boots, body armor and helmets to receive various beneficial powers. Ratchet also has his trusty swingshot so he can get swingin' like furry guys do. High Impact Games seem to have done a super job of shoehorning the game into the PSP, with some high quality visuals and a great selection of extra game modes. 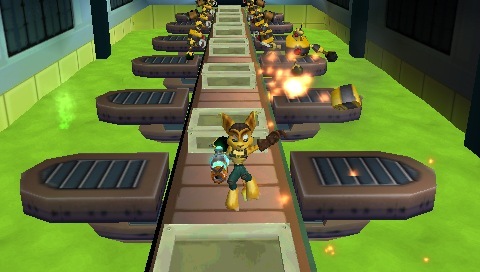 It's a popular thing at the moment to add wireless multiplayer action to your game, which is a sweet addition for Ratchet and Clank. There's going to be all kinds of deathmatch modes, featuring a total of 4 players, so it's either a free for all or 2v2 play. There's also Capture the Flag and a new mode called "Iron Lombax" which is a challenge based game, pitting you and a rival team against each other in a series of ever more difficult (and insane) tasks in a variety of different environments. Also introduced is Nemesis mode, which basically highlights the player who has whacked you the most, enabling you to get your revenge on in a more serious manner! The only thing I can see as being a bit of a let down is that I've seen no mention of the game utilising the PSP mic & headset, so no trash talking with your opponents. As people who play on Xbox Live will doubtless be aware, that's half the fun! More developers should make an effort to include comms in their games. Otherwise, well done to the guys for adding a decent, well-rounded online and wireless multiplayer experience. 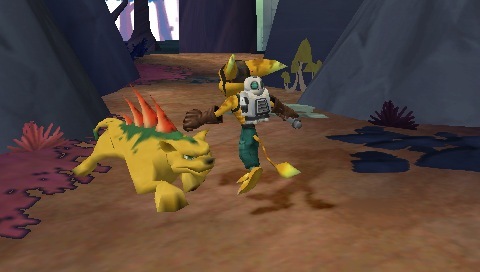 This game is certainly shaping up to give friend Daxter a run for his money. It's looks to be a great game, especially coming at a time of year that is usually quite the gaming wilderness. Ratchet and Clank: Size Matters launches soon enough, 02/13/07. So here's to hoping it's gonna live up to its ancestors.